Some of the stuff I end up painting makes me laugh. 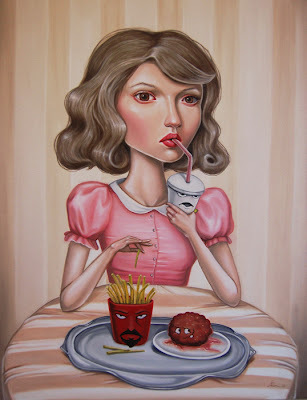 I think to myself " Im sitting here in all seriousness painting a meatball with a face"
I love the painting. My daughter and I were the same way with ATHF. She loved it and doesn't understand why we don't watch it together anymore. A little bittersweet. the one episode when Carl tries to enlarge his thingy with that "ray" and all those huge crabs came out, my son asked what those where haha. Thats when I knew. is this brilliant piece for sale?